Joker Game is a long-running Japanese spy series that premiered with a book of the same name published in 2009 and written by Koji Yanagi and has been followed by two sequel novels and a 2015 live-action movie that received moderate success. The anime adaptation will be handled by Production I.G (Attack on Titan, Psycho Pass) and directed by Kazuya Nomura who also directed the 2015 Ghost in the Shell movie. So as expected it’s gotten a lot of people's attention. So with such a powerhouse studio behind and an experienced animation team heading it how well does the first episode go down? The direction and animation are superb with excellently framed scenes and usage of shadows and colour to manipulate the mood and create intrigue when needed. The lighting is superb and used as way to enhance the scenes rather than just being present. There’s obviously been a lot of work put into the world making it look and feel like the 30s and you can sense that in everything; vehicles, costumes, architecture; the world feels genuine. Facial expressions play a large part in filling us in on the characters thoughts when there is little dialogue. Every character’s movements and facial expressions are descriptive and personal to them, making up for some of blander designs. What I appreciated in the characters and their designs was the maturity and seriousness that they were taken with. I’m all for bright and loud characters but in what is selling itself as a serious drama it’s refreshing to see that all the spies are professionals and there’s not a single psychic teenager amongst them. The opening reflects the motif of espionage with a misty overlay over imagery of smoke, mirrors, shadows and card tricks. We are introduced to our main cast and we get an early feeling of their personalities accompanied. It invokes the feeling of a vintage spy film which is exactly what the show is trying to recreate. The opening (“Reason Triangle“ by Quadrangle) is an upbeat number with blaring rock riffs that serves to pump the viewer up for upcoming action. The ending is a slower rock number that allows the viewer to cool down after all the action and gather their thoughts. The soundtrack so far has been phenomenal , fitting each scene and showing incredible range from slow jazz and bouncy jingles to flipping in an instant to sinister ambience. There’s a heavy presence of cards and card games alluding to themes of deception and wit. 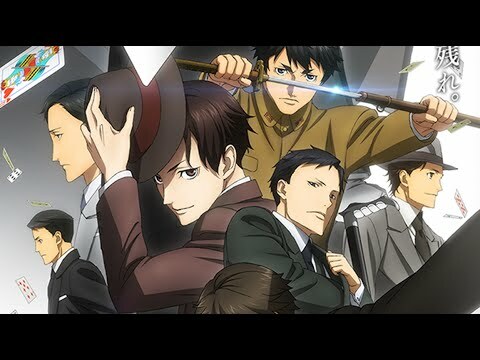 The actual “Joker Game “is an interesting concept that I assume and hope will continue to appear and be used as a clever method to develop characters through action. Joker game is extremely well written with an interesting narrative and it explores themes and ideas that have been done before whilst avoiding falling into clichés. The suspense feels unforced unlike other series and I was grabbed instantly by the first few seconds as the opening scene set the tension sky high: we begin on a foreign businessman having his house searched by the D-agency. The foreigner protests until a soldier steps forward and declares that if nothing of suspicion is found the lieutenant in charge of the search will commit hari-kiri ( ritual suicide with a katana ) escalating the stakes to maximum in a second.